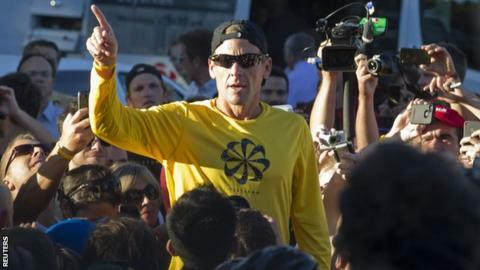 The United States Anti-Doping Agency (Usada) is preparing to reveal its evidence against Lance Armstrong. Usada has banned the American cyclist for life, stripping him of his record-breaking seven Tour de France titles. The move followed Armstrong's refusal to answer charges that he was the "ring-leader" of a doping conspiracy. Armstrong says he is innocent and that only the sport's governing body, the International Cycling Union (UCI), has the power to sanction him. Cycling's global governing body, the International Cycling Union (UCI), has challenged Usada's jurisdiction over doping in the sport, and has the option of appealing against the ruling to the Court of Arbitration for Sport. It says it will not take any action or comment further until it has received evidence from Usada explaining why Armstrong must lose his titles. He won the Tour de France seven years in a row from 1999. He retired from cycling in 2005 but returned to the sport between 2009 and 2012. Tour de France organisers said they would wait for the outcome of any stand-off between Usada and the UCI before taking action. With the UCI giving the impression that it agrees with Armstrong, Usada is under pressure to provide more details of its case. The agency has been concerned that its witnesses have to be protected from outside influence. But Usada is aware of the need to counter Armstrong's claims it has gone beyond its jurisdiction with an investigation that is an "unconstitutional witch hunt", based on "corrupt inducements" to other riders. The Colorado-based agency is not overly concerned with his attacks, but realises it must do more to convince a divided public it has compelling, and ultimately damning, evidence against one of the world's most famous sportsmen. The bulk of that evidence is testimony from at least a dozen of his former team-mates and associates, but it is not, as has been reported, evidence gathered during the federal investigation into allegations of systematic doping at the US Postal Service cycling team. A branch of government, the US Postal Service was the main sponsor of Armstrong's team between 1996 and 2004, a period that covers six of his seven Tour wins. Battle with cancer: Diagnosed with testicular cancer in 1996. The disease spreads through his body. Launches Lance Armstrong Foundation for Cancer. Declared cancer-free in 1997 after brain surgery and chemotherapy. Retirement: Announces he will retire after the 2005 Tour de France, which he wins. Angered by drug allegations against him, Armstrong announces in September 2008 he will return to professional cycling. In June 2010, he reveals via Twitter that the 2010 Tour de France will be his last. On 16 February 2011, Armstrong announces his retirement again. Using state money to buy performance-enhancing drugs would have been a criminal offence, but it was decided this would be too difficult to prove and the two-year investigation was halted earlier this year. But Usada has not had access, despite requests, to the evidence the Food and Drug Administration investigators gathered, and has built its own case. Having weathered Armstrong's attempts to have this case thrown out by a judge, political pressure from one of the rider's supporters in Congress, criticism from sections of the US media, and the UCI's opposition to the process, Usada remains confident its side of the story will convince all but the most ardent of the rider's supporters. Some of that story will emerge during the public hearings that have been requested by Bruyneel, Pedro Celaya and Pepe Marti, respectively the manager, a doctor and a coach at Armstrong's former teams. Two other doctors, Michele Ferrari and Luis Garcia del Moral, did not respond to Usada's charges, and were given life bans last month. Marti was also banned but that was reversed when his lawyers made it clear he wished to fight for his career in sport. Due to the nature of the charges, elements of the evidence against Armstrong will be aired at that time. But with no date set for the panels to convene, that is unlikely to happen until the end of the year. However, significant parts of Usada's Armstrong dossier will be made public before those hearings via the media or in communication with the UCI. Only cycling's governing body can impose the sanctions announced by Usada, but there is precedent for doing so. As a co-signatory of the World Anti-Doping Agency's "Code", the set of anti-doping rules that most sports have followed since 2004, the UCI's room for manoeuvre appears limited. But this has not stopped the federation from discussing a legal challenge to Usada's ruling with a number of lawyers. This challenge, should it proceed, will be based on jurisdiction and "retrospectivity", the fact the offences go back further than sport's eight-year statute of limitations. The UCI greeted Usada's decision last week with a terse statement asking for a "reasoned decision" as to why it should apply the sanctions. Usada is preparing that report now and is confident the statute of limitations does not apply as Armstrong has previously lied under oath when asked about drug-taking. Armstrong, however, told reporters at a World Cancer Congress event in Montreal this week that he was "not afraid" of any report Usada might send to the UCI. The rider, who almost died of cancer in 1996, has raised huge sums of money for cancer awareness via his foundation. Speaking to delegates in Montreal, he said: "My name is Lance Armstrong, I'm a cancer survivor, and yes, I won the Tour de France seven times."